The main scope of this study is to examine how the use of digital tablets may facilitate preschool children’s possibilities to participate in minority language activities. The study is conducted in Sweden, where five official minority languages are stated in national, as well as European Union, legislation: Finnish, Yiddish, Meänkieli, Romani Chib and Sami (SFS, 2009: 600). In this article, the minority language Finnish is in particular focus, and the data is collected in an administrative area for Finnish. At the same time, the possibilities of using digital resources as means for creating opportunities for language learning and communication is discussed in various fields of research (cf. Edwards, 2010; Agirreazkuenaga, 2012; Jones, Cuncliffe & Honeycutt, 2013; Sauro, 2016). In this study, a municipality project2 was started in an administrative area for the minority language of Finnish involving 15 preschool groups. The main aim was to explore how the use of digital tablets in preschools may enable children’s communication in a minority language, with a particular focus on children’s participation in multilingual activities. This study also poses an alternative to the focus on problems concerning a lack of knowledge of the majority language (see, for instance, Cummins, 1979; Lervåg & Aukrust, 2010; Melby-Lervåg & Lervåg, 2011) and the overall attention to language development. Instead, attention is drawn to the children’s possibility to be co-producers of activities in the preschool environment by using their own experience, background and language knowledge. In the vast area of studies concerning children’s multilingualism and children’s language learning (for recent research, see Cekaite Thunqvist, Blum-Kulka, Aukrust & Teubal, 2014), the main focus tends to be on face-to-face, verbal communication. In the field of computer-assisted language learning, the effectiveness of using digital resources for language learning seems to be more in focus (cf. Levy, 1997). When it comes to minority language learning and communication, only a few studies have explored the possibilities of using digital resources. These generally describe different digital and media resources as important factors when it comes to communication in minority languages (see Jones, Cuncliffe & Honeycutt, 2013; Edwards, 2010; Agirreazkuenaga, 2012). These studies, however, are mostly conducted on older children or adults. The work concerning the inclusion and empowerment of minority groups through the use of digital tools can be seen as “relational equity,” as discussed by DiGiacomo and Gutiérrez (2015) when working with making and tinkering3 activities. In a Swedish setting, the preschool environment is generally dominated by a monolingual Swedish norm, as shown by Björk-Willén, Gruber and Puskás (2013). Studies focusing on bilingualism and multilingualism in Swedish preschools are often focused on either the use of different languages (see Bagga-Gupta & Carlsson, 2006) or on code-switching practices and children’s participation in play activities (see Björk-Willén, 2007). Evaldsson and Sahlström (2014) conclude that the differences in how a child uses the languages of Finnish and Swedish in different settings are closely related to the peer group’s engagement and which sociolinguistic forms of communication are formed collectively. Björk-Willén, Gruber and Puskás (2013) also discuss that physical artifacts, and verbal as well as non-verbal communication, become resources for children in a multilingual preschool environment. A Swedish study shows that some mother tongue teachers use digital resources such as tablets to motivate children to take part in mother tongue training activities (Kjällander, Moinian & Dorls, 2016). Therefore, Swedish research on children’s use of minority languages is constricted to a few studies mainly focusing on the use of verbal and sometimes corporeal communication in their language communication. However, there is a lack of research on how young children’s use of digital resources may facilitate minority language communication. On a more international level, Wells Rowe and Miller (2016) have shown how digital tablets can be used in multilingual storytelling activities but emphasize that the participants only started to use the non-majority language when the setting was re-designed to encourage this. Studies exploring digital tablets, in particular in educational settings, are often conducted with older children or adults, such as in the works of Bush & Cameron (2011) and Garcia & Friedman (2011), where it was found that digital tablets can be valuable tools for learning. The use of digital tablets can also include a change in the form of primary- and secondary-school assignments towards more “open” exercises (Kongsgården & Krumsvik, 2016). In preschool environments, digital tablets can be seen as useful resources in language learning and literacy sessions (Sandvik, Smørdal & Østerud 2012: 204). In Swedish preschools, children use both vocal and embodied ways to interact with each other when using digital tablets, and they develop different strategies to gain access to the digital tablet (Walldén Hillström, 2014). The teacher also plays an important role when children engage in digital tablet activities in Swedish preschools (Nilsen, 2014). But while the teachers have a didactical (learning) aim, the children often want to play games and the so-called “educational apps” do not always turn out to be all that educational (Nilsen, 2014). Kjällander and Moinian (2014), however, found that through play, children in Swedish preschools are constantly redesigning digital tablet activities, positioning themselves as producers of media, as opposed to merely media consumers (Kjällander and Moinian 2014: 28–29). In a similar vein, the possibilities of the digital tablet as a means for young children to represent their ideas in an educational setting are also pointed out by Couse & Chen (2010: 95). Nevertheless, there are limitations in relation to the use of digital resources, such as digital tablets. First, for example, the lack of face-to-face contact can be understood as a restriction. Petersson, Lantz Andersson & Säljö (2013: 153) conclude that virtual experimentation in a digital science lab does not, in itself, bring about learning, but may rather be seen as part of the pedagogical environment where a teacher is needed. Second, digital tablets are not always used to their full potential (Kongsgården & Krumsvik, 2016); for example, for collaborative learning or using the cloud service for easy assessments. In this study, the video chat service Skype is one of the applications used by the participating children and teachers as a resource for children’s communication in a minority language. While a number of studies have been conducted exploring how video chat services are used by parents, grandparents and children in a home environment (see, for instance, Moffatt, David & Baeker, 2013; Raffle et.al., 2011), fewer studies have been conducted in an educational setting. It has been argued that one of the greatest advantages of Skype and other Voice over Internet services in educational settings is that they enable students to communicate with people at a distance, such as experts, book authors, schools in other countries or schools involved in common projects (Morgan 2013). Skype can prove to be a valuable resource when making education accessible to children afflicted with chronic diseases, enabling them to receive education in a well-known, accessible place–their home (Simeonsdotter Svensson, Pramling Samuelsson, Hellström & Jenholt Nolbris, 2014: 1022). In addition, it has been noted that children display social, digital and language skills when skyping, using many different, often embodied, modalities (Aarsand, Melander and Evaldsson, 2013). Other advantages include that the children, regardless of geographical distance, could see the teachers’ faces when skyping. For example, the use of Skype in education can help children communicate with other children from all over the world and “help them build bridges across cultures in authentic and meaningful ways” (Kirkwood, Shulsky & Willis 2014: 12). These affordances—enabling face-to-face communication, unrestricted by geographical limits—are seen as didactical possibilities for a preschool environment facing the challenges of ensuring the right of children to communicate in their own language and be part of a living “speech community” (see Hudson 1996). Both in the emerging interest in touch screen devices, such as digital tablets, and in the expanding understanding of the significance of embodied interaction, there is a need for a more specific notion of what touch is in relation to meaning-making (Bezemer & Kress, 2014). Touch can be seen as implicit, explicit or as a mode of representation and communication in itself (ibid.). If implicit, touch is a means to get to something else. An example of this is when touch is used to navigate a touch screen device; it is a way to use the digital interface. When touch is explicit, however, the mode is meaningful in itself; for example, when seeing-impaired people use touch to navigate using a white stick. For touch to be a mode of communication in itself, however, it needs to be addressed to someone (interpersonal), used to communicate something (ideational) and be coherent with other modes of communication (intertextual), such as speech (ibid.). The notion of touch as implicit is adopted in this study and, as illustrated below, the children use touch as a medium to move an item on the digital tablet screen. The children’s use of hands can also be perceived as communication between peers. As suggested by Davidsen and Christiansen (2014), the use of hands as a means of communication and collaboration is vital for children using touch screens in an educational setting. As shown in this study, children’s use of hands and touch prove to be important parts of the multimodal participation in multilingual activities. The aim of this study is to examine how the use of digital tablets may facilitate preschool children’s possibilities to participate in minority language activities. Applying a social semiotic approach, the participating children’s ability to act as producers of multilingual activities through the use of digital resources is assessed. Furthermore, different possibilities and challenges that can arise when digital tablets are used to create activities including a minority language are discussed. A video ethnographic approach (see Heath & Hindmarsh, 2002) has been used in the collection of data in three Swedish preschool groups with children aged one-and-a-half to five years old, in three groups in three different preschools, located in a socio-economically and culturally diverse area. Each group comprised of 15–20 children and three teachers, where most of the children were bilingual users of Swedish in addition to their minority language, Finnish. Everyday preschool activities, in which the children communicated and played with digital tablets, were recorded using a hand-held video camera, consisting of approximately 15 hours of film. Ethical guidelines (Vetenskapsrådet, 2004; 2005) were strictly followed; authorized letters of information were signed by all parents, where information was given about voluntary participation, the right to end the participation at any time, that the data is kept in a safe and that all participants are anonymized. The participants’ parents have agreed to data collection via video and photographs and that all pictures will be anonymized before being published in any research. The children themselves have been included in the ethical considerations in several different ways: first, by introducing myself as a researcher in the children’s group for at least three days, so that the children have a chance to feel comfortable enough to express their willingness or reluctance to being filmed; second, by showing the camera and how it works, so that the children have a chance to see that films and pictures are being recorded; third, by verbally for asking permission before turning on the camera and also by being apprehensive about every individual child’s non-verbal expression while recording. For example, if a child showed any sign of not wanting to take part in the film by intentionally turning his or her back to the camera, looking sad, upset or otherwise reluctant, I turned the camera off. These instances are of course subject to my interpretations as a researcher, but I have made the utmost effort to respect each child’s possibility to give permission as well as to withdraw it, even if this has formally already been given by the parents. How do the affordances of digital tablets facilitate or restrain preschool children’s possibilities to participate in minority language activities? One of the participating groups consisted of children and teachers who were all bilingual in Finnish and Swedish. As the teaching was conducted in the Finnish language, this group will from here on be referred to as the all-Finnish-speaking group. Nevertheless, it should be noted that the children in the all-Finnish-speaking group used both Finnish and Swedish in their peer interactions. Overall, all of the Finnish-speaking children in the three groups where data was collected had varied knowledge of the Finnish language. Some of the children were fluent and used Finnish in their daily communication with their parents, some only knew a few words, or could understand spoken language, and some children had grandparents with whom they spoke Finnish. In preparation, teachers took part in an introduction concerning the project’s aim, receiving in-house training in basic digital tablet use, where each participating group had two digital tablets. A range of applications was chosen in collaboration with the participating teachers, as they took part in workshops where they collaboratively tried out new applications and shared their experiences within the project. The applications used in the municipality project included “talking dictionaries” with pictures and Finnish spoken as a verbal language, memory game applications where the children could create their own memory cards and record their own verbal Finnish content,5 story-telling applications in Finnish,6 drawing and voice-recording applications where children can create their own story, tell it, record it and replay it,7 the Finnish television application Pikku Kakkonen8 and Skype, where the children could communicate with other Finnish-speaking children and teachers in other preschools. During the project, the teachers were part of ongoing workshops where they together tried out new applications as well as shared their experiences within the project. On the first few occasions, the teachers were also shown ideas how to design learning sequences, aiming to enable children’s communication in Finnish. However, as the project continued, the teachers, as well as the children, became co-designers of the activities; for example, by helping to choose and assess the different applications. In order to answer the research question, the social semiotic approach Design for Learning framework (Selander & Kress, 2010) has been used. This approach recognizes the possibility of both teachers and children designing informal or more formal learning sequences (Selander & Kress, 2010). The setting plays a significant role, as well as the various multimodal resources used in the design (Selander & Kress, 2010). A digital tablet, for example, has other affordances, or possibilities and restraints, than a book and this plays a significant role in the overall design (Selander & Kress, 2010). The concept of affordance, coined by Gibson (1979), is used in this article to describe the possibilities that emerge in the meeting between people and the environment. More specifically, affordance is used in this study to describe the interplay between the children and the environment and how different possibilities form in the meeting between people and the environment (see Gibson, 1979). As noted by Selander & Kress (2010), who have also taken inspiration from Gibson (ibid. ), a certain object’s affordance is always subject to the meaning people make of it and the affordance is also dependent on cultural and social surroundings. In using the concept of affordance, both the environment and the different objects and materials in it and people’s use and understanding of these influence the affordance that emerges (ibid.). In this study, this means that the affordances of the digital tablets emerge when the children use them in the preschool environment. The use of Gibson’s (ibid.) concept, also opens up for the understanding that different applications have different affordances and that these emerge when the children use them. In this study, how the children can use the different affordances of the digital tablets to communicate in a minority language is of particular interest. In the Western world, spoken and written modes of communication have traditionally been favored over other modes of representation, such as pictures, music, colors, etc. (Kress, 1997). In the design of digital tablets, however, affordances emerging from the use of the touch screen and corporeal modes are critical for the ability of young children to use them, without having to be able to write on a keyboard or handling a mouse (Petersen, 2015). The affordances of the applications are also often built on modes other than written or spoken language (ibid.). For this purpose, the analysis in this study focuses on as many modes of representation as possible, in line with the theoretical standpoints used in this study, which recognize that children can use a wide array of modes to represent their meaning-making (Selander & Kress, 2010). By using a video ethnographic approach (see Heath & Hindmarsh, 2002), multimodal data could be collected and modes of communication beyond spoken language were made possible to reflect upon. Furthermore, children are seen as constantly making choices about which modes to use, and in which combinations, to make representations using what is at hand (Kress, 1997). In this study, the children are not just seen as media consumers, but as media producers and active designers of the learning sequence (Selander & Kress, 2010). When applying the social semiotic approach, Benyamine (2008: 201) claims that when children get to process their own digital media material (e.g., photographs), the creative experience allows for children’s own stories and identities to be part of the learning process. Kjällander and Moinian (2014) conclude that children are active designers of digital activities when using the same approach in their study on preschool children’s use of digital tablets. Åkerfeldt (2014) was able to discuss how the use of different digital resources help shape conditions and possibilities for representing knowledge in different ways by using a social semiotic approach. The framework made it possible for the researchers to both consider a wide array of multimodal communication within and around the digital interface, as well as show how children are active producers and designers of media. In this study, the social semiotic framework will be used to understand children’s communication beyond verbal representations, opening up for an extended notion of the affordances provided by digital resources for children’s communication in more than one language. When transcribing and analyzing the data collected in this study, a first overall categorization has been made where concepts used in the social semiotic approach have been applied. Two excerpts have then been chosen to illustrate how the affordances of digital tablets can facilitate or restrain children’s possibilities to participate in minority language activities. In the analysis of complex research data, such as music videos (Domingo, 2011) and comic strip style transcription (Ivarsson, 2010) where many different modes, such as color, shape, size, sound, etc. can be studied, a developed form of both multimodal transcription and analysis is required (Domingo, 2011). A disadvantage, however, is that modes such as music have to be transcribed into written language. In line with the social semiotic approach used as a theoretical framework in this study, these changes in modes always bring about changes with regard to the content as well (Selander & Kress, 2010). Kress (2011) discusses whether social semiotic multimodal theories are compatible with ethnography and how, if possible, they could be brought together. 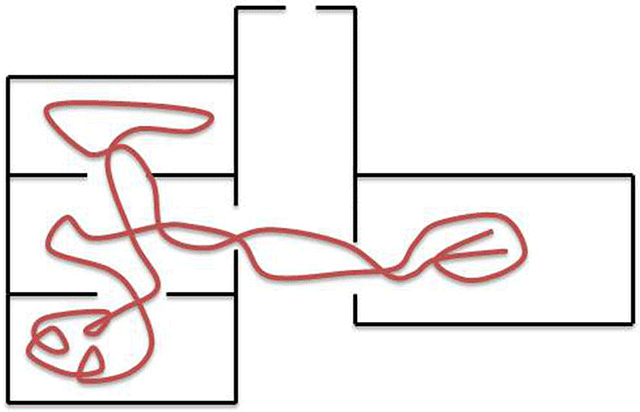 In an example taken from Bezemer (forthcoming), Kress (2011) shows how theories and methodologies are chosen and assembled to be able to examine a laparoscopic surgical activity. A combination of conversation analysis, multimodal analysis, symbolic interaction and ethnography was used to enable taking into consideration that although speech did occur in the surgical activities, it would typically not concern the actual surgery. Rather, gazes, changes in posture and actions on the screen were used to communicate during the surgery (Kress, 2011). The theories and methods had been chosen and combined to “complement, to ‘fill out,’ data which one theory by itself, cannot produce” (Kress, 2011: 240). Further, Kress (2011) stresses that the modes of communication omitted in the transcriptions are often made invisible: “This acts as an (usually) un-noticed regulator on other practices: phenomena which are not ‘visible’ or ‘audible’ tend not to be researched; often they are assigned to domains regarded as ‘implicit’ in some way” (Kress, 2011: 253). With inspiration from Kress (2011) and others, an attempt was made to perform a multimodal analysis of the data collected in this study. The categorization process was conducted in three stages. First, an overall categorization was made on an Excel spreadsheet. Here, a broad identification of modes used by the participants as well as in the applications was noted; for example, when and how the participants used verbal and/or corporeal modes. When analyzed, a pattern emerged, showing, for example, that activities in which more open-ended applications were used often coincided with longer, more narrative and singing style verbal modalities in the minority language and vice versa. About half a dozen of these occasions were more thoroughly transcribed in a second stage of the process, utilizing a comic strip style transcription. A more detailed description of the modes and applications used was also made. In the third step, two of these excerpts were chosen for closer analysis. In the following section, two examples representing the larger data set collected have been selected to illustrate how the affordances of digital tablets can facilitate or restrain preschool children’s possibilities to participate in minority language activities. The first example is of a more fixed application: a talking picture dictionary. The second is an example of an activity where the applications’ affordances enable the children to design their own content—in this case the ways in which children communicate through Skype. In this first example, an application in the style of a talking dictionary is used by the participants, where different colors are in focus (Figure 1). A Finnish-speaking, bilingual child aged four, here called Jenna, located to the right in the pictures, uses the application together with a Swedish-speaking friend and a Swedish-speaking teacher. When the teacher encourages the child to speak Finnish, they collaboratively use the emerging affordances (Gibson, 1979; Selander & Kress, 2010) of the application to find out what a certain color is called in Finnish, even though the teacher does not know Finnish. The specific affordances of the touch screen (cf. Bezemer & Kress, 2014), in addition to the pictorial and auditive modes (Selander & Kress, 2010) within the application, provide the possibility to return to a page, press a picture and listen to what a color is called in Finnish. As the example (Figure 2) illustrates, the child is first unsure or perhaps unwilling to say “yellow” in Finnish, but when the application’s verbal mode communicates in Finnish and says “keltainen” she repeats keltainen and smiles. As representative of the overall results, the use of this kind of talking dictionary often results in the children using Finnish verbal utterances. Mostly, however, when this kind of application is used, the children’s Finnish verbal representations are kept to short, one-word reiterations, in spite of the teacher’s encouragement to speak Finnish. Longer conversations never occur in a Finnish verbal mode when using these kinds of applications; not in the all-Finnish-speaking groups with Finnish-speaking teachers, nor in the group where only one child speaks Finnish. Here, they either choose to speak Swedish or to be quiet. But, in line with the social semiotic approach, the verbal (or written) modes of representation, language, are only parts of a wide array of modes of communication (Kress, 1997; Selander & Kress, 2010). In this example, the children are communicating in many other modes—pictorial and musical modes on the tablet, smiling, pointing at and touching the pictures in the application and bending over the tablet. Here, the children also use their hands to communicate and collaborate around the touch screen, much in the same manner as shown by Davidsen and Christiansen (2014). These are modes of communication that can also be used as the children engage in multilingual activities and when communicating in a minority language. The multilingual activity permeates the whole activity and is made possible by the overall design of the activity and the affordances of the application. Furthermore, even if the children use seemingly short, one-word verbal communication, these utterances are seen as much more than mere copies of the application’s speech. In accordance with Kress (1997, 2003), representations are always new and there are no copies; and in this study, even a single-word communication can be significant, as well as a smile seen on the child’s face. The participants use the color talking dictionary application. 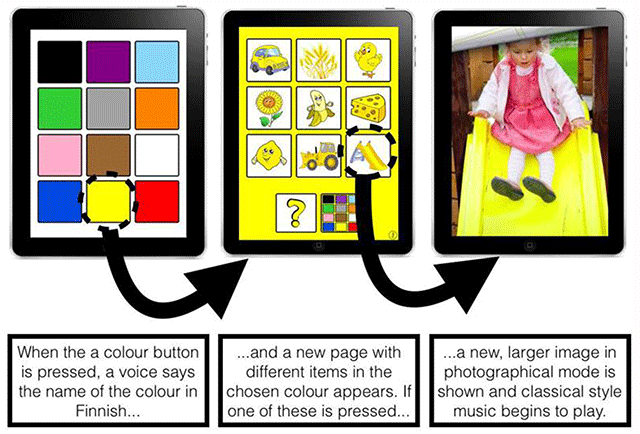 This second example shows how children in two different preschools use Skype on a digital tablet (Figure 3). The participants are organized into two small groups, one of which is visible in the video recording, and the other on the digital tablet screen. The video-recorded group is part of an all-Finnish-speaking preschool group, where the children, here called Greta and Miles, are bilingual and the teacher, here called Anja, is Finnish-speaking with a good knowledge of Swedish. The child seen on the tablet screen, here called Maria, is bilingual but does not have access to Finnish-speaking children or teachers at her own preschool. Maria’s Swedish-speaking teacher is also present, here called Birgitta. Illustration of the Skype application. The design of the Skype application, together with the possibility to go online, enable the children to see and hear other children and communicate using verbal, visual and auditive modes regardless of geographical distance. The choice of language is not set by the application but is chosen and created by the participants. In this example, the emerging online visual and auditive affordances of the digital tablet are intertwined with the teacher’s setting for the activity. Together with the children’s own design, these affordances enable the children to participate in a multilingual activity including the minority language. As shown in the above example, when the teacher, Anja, first uses the Finnish language, the student, Maria, does not answer in any verbal mode. But when the teacher and the other children start singing a song Maria recognizes, this acts as a prompt (Selander & Kress 2010) and Maria starts to smile and sing along. When Maria starts singing, she uses the same modes of representation as the other participants (Selander and Kress 2010), choosing to use the minority language to communicate. Since Maria does not have any Finnish-speaking peers or teachers in her preschool group, the use of a video chat service is key for enabling her to engage in singing with other Finnish-speakers. The possibility to see and hear each other, in real time or near real time, makes for crucial affordances for communication in the minority language setting, even if all communication is not in verbal Finnish per se. The children’s representations seamlessly enter each other (Selander & Kress, 2010) when they use speech, singing, smiling and watching each other on the tablet screen, etc. Meanwhile, the teachers engage in a kind of informal assessment set in this particular culture of recognition when they initiate the Finnish song and say “Jååå.” This example also underlines the significant role of the teacher as a designer of the setting (Selander & Kress, 2010), enabling the children to communicate in a minority language, both beforehand and within the activity. The emerging affordances of the digital tablets help shape this activity into something contemporary and of interest to the children (cf. Dyson, 2003). 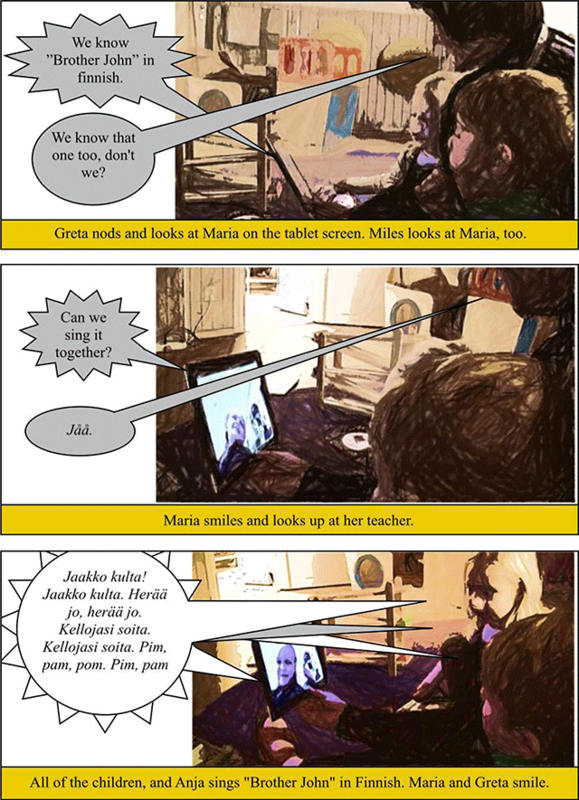 When the activity continues, the children use the portability affordance of the digital tablet, in combination with the online auditive and visual affordances, to show Maria around. They use corporeal modes when they walk through the rooms of their preschool, spinning around and pointing the digital tablet at many different items in the environment, making it possible for Maria, located in a preschool several miles away, to see their everyday preschool environment. Before ending the activity, they decide that they should come visit one another (which they later did). The skyping sequence continues with conversations, in both Finnish and Swedish, between the children, as well as between the children and the teachers. It ends with the children carrying around the tablet, showing each other their preschool environment and deciding that they should come visit one another. Here, the portable affordance of the digital tablet becomes vital, as the children decide to walk out of the room in which they were originally situated when having their singing activity and show the rest of their preschool environment. As illustrated by the above examples, the overall affordances of the digital tablet’s design are also always intertwined with the affordances of the specific application. 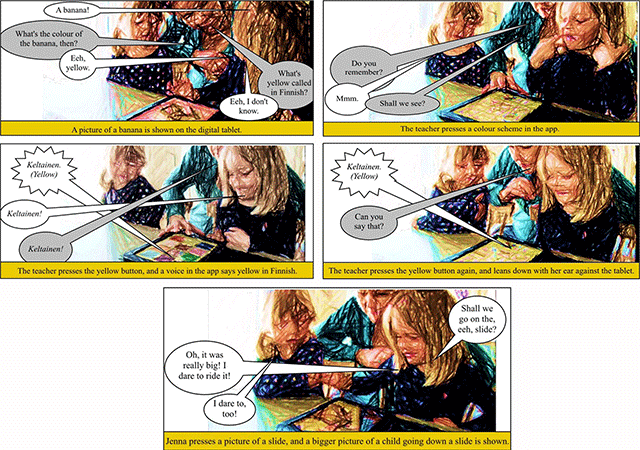 It would not be possible for the minority-language-speaking children in one preschool to show their peer around the premises without the joint affordances of the tablet’s portability and the application’s real time video communication, as shown above (Figures 5 and 6). This can be compared to Gibson’s (1979) notion of the interplay between the environment, the objects and the people in it. Moreover, the digital tablet’s online affordance, for example, is crucial for using the Skype application. The children’s use of the corporeal mode of the touch screen also emerges as a central affordance, which acts as a foundation for all applications and enables the participating children to manipulate and engage with the content of the digital interface with the touch of a finger (cf. Bezemer & Kress, 2014). In relation to the video chat and online affordances, the corporeal mode of the touch screen, in this particular sense, is a way for the children to, for instance, touch the applications to start or end a call. The participants use the Skype application. The participants use the portable affordance of the digital tablet. The approximate movement of the children through the rooms of the preschool when showing their environment on Skype. The emerging affordances (Gibson, 1979; Selander & Kress, 2010) of applications such as Skype enable the Finnish-speaking children to see and to speak to other Finnish-speaking children and teachers in other preschools. Applications like Skype also require content, here formed by the children’s multimodal representations; without them, the application is unusable (cf. Kjällander & Moinian, 2015). In this study, and in agreement with Sandvik, Smørdal & Østerud (2012), the use of digital tablets can be seen as useful for creating language activities. Furthermore, as proposed by Kjällander and Moinian (2015), the children as media producers act as re-designers of the content of the digital tablet applications. The results illustrate that when children design their own content in activities (e.g., when skyping), they start to communicate in verbal modes in a minority language and actually start to speak, in this case Finnish, in a more narrative or singing mode, combined with other modes of communication (Kress, 1997). Other aspects, such as the group’s linguistic makeup, are also part of the setting of these activities. The teacher’s design of the setting is also a constant factor (Selander & Kress, 2010). These results concur with Simeonsdotter Svensson, Pramling Samuelsson, Hellström & Jenholt Nolbris (2014), who point out the importance of the children being able to see their teacher when skyping from home, as well as with the results of Petersson, Lantz Andersson & Säljö (2013), concluding that digital virtual experiments cannot rule out the role of a teacher. In this study, the talking dictionary applications can be compared to the virtual experiments of Petersson, Lantz Andersson & Säljö (2013), where the outcome was quite fixed, and where there was little room for the children’s own design. On the other hand, applications based on content created by the children, such as Skype, can be seen as more authentic because the children can actually see each other or themselves, which is in line with the findings of Kirkwood, Shulsky & Willis (2014). These affordances, built on visual video and online modes, prove to be vital for children to communicate in a minority language, as shown in the second example. The portability affordance of the digital tablet was also an important factor enabling the children to use corporeal modes of communication as a part of their multilingual activities, such as when the children showed their peer around their preschool. More fixed applications, with affordances where the children had small means for co-designing the content, such as Talking Dictionary applications and Talking Memory game applications, did not facilitate the children’s communication in verbal modes in the minority language in the form of longer narratives, songs or conversations. This can be compared to Nilsen’s (2014) discussion that “educational” applications are not always a guarantee for learning. Nevertheless, when encouraged by the teacher, the affordances of these perhaps more inflexible applications did make it possible for the children and teachers, in groups with only one minority language speaker and with Swedish-speaking teachers, to find a common ground where they could both explore specific words and discover what they were called in Finnish, as shown in the first example. Even when the children were not using all that many Finnish verbal modes, however, they used a wide array of corporeal, facial (e.g., smiling), musical modes or representation within and in combination with the spoken Finnish language, which were connected with just that: the Finnish spoken language, not the Swedish (cf. Evaldsson & Sahlström, 2014). This could be seen as a way for the children to use a wide array of modes to communicate within the Finnish-speaking setting. Since the modes are always used together and cannot be separated (Kress, 2003), and the children often use corporeal modes to respond to the verbal Finnish communication of other people, or the tablet, these kinds of activities can also be understood as minority language communication. In line with a social semiotic approach (Selander & Kress, 2010) where all the children’s multimodal communication with each other (e.g., using Skype) is set in a Finnish-speaking online environment could be seen as minority language communication. This could open up for a new understanding of how to create multilingual environments in preschool—perhaps where not only verbal, but smiling, laughing and glancing representations are also used to support the use of Finnish. As shown in Figure 6, the children use corporeal modes when walking, spinning, roaming around and showing their Skype partner their preschool environment. In Figures 2 and 4, the participants are smiling at the same time as they listen to or communicate in the minority language. Are they smiling in Finnish? The notion of what language is in this setting can then be reconceptualized with inspiration from Flewitt (2006), as well as from a social semiotic point of view (Selander & Kress, 2010). Kongsgården & Krumsvik (2016) call for the use of the full potential of the digital tablet, and in this study some of the special possibilities provided by the tablet are utilized to create multilingual activities. In conclusion, many of the affordances created in the use of digital tablets enabled the children to participate in minority language activities. Here, it is also important to take into consideration that, prior to the start of the municipal project, the children had little or no possibilities to participate in multilingual activities, except for the children in the all-Finnish-speaking group (cf. Evaldsson & Sahlström, 2014). The didactical implications of these results are that the use of digital tablets, in combination with the use of applications in a minority language, can open up for the possibility of children’s communication in that language, much in line with the work of Jones, Cuncliffe and Honeycutt (2013), Edwards (2010) and Agirreazkuenaga (2012). The resources, in this case both in the form of different applications containing the minority language as well as more open-ended applications, can be seen as a way to encourage the children’s use of the minority language, as found by Wells Rowe and Miller (2016). At the same time, as the results suggest, the teacher’s didactical design is also crucial (cf. Selander & Kress, 2010; Nilsen, 2014) in creating a setting where the children are given access to both the digital resources as such and are encouraged to communicate in the minority language (see, for example, excerpt 1). What is unique in this study is that it shows how the children can act as producers of activities where their own prior knowledge of the minority language contributes to their preschool environment. Instead of being seen as lacking sufficient knowledge of the majority language (cf. Cummins, 1979; Lervåg & Aukrust, 2010; Melby-Lervåg & Lervåg, 2011), there is engagement with the skills of the minority-language-speaking children, with the help of the affordances of digital resources (cf. DiGiacomo & Gutiérrez, 2015). Another didactical possibility of using digital tablets in multilingual activities proved to be the chance to integrate the children’s own popular culture and media experiences in the classroom (Dyson, 2003). Even if the use of popular culture in educational settings is nothing new, the deliberate design of bringing in minority language content in the form of popular culture may prove to be a useful didactical contribution brought forth by the results of this study. For example, popular Finnish children’s TV programs were easily accessible by using the YLE application, as well as a wide range of songs with Finnish verbal content on, for example, YouTube. These are also examples that challenge the print-centered system in many educational settings (Dyson, 2003) and pose an alternative to teachers’ lack of uptake on children’s background, language and culture if they do not belong to the dominant ones (Willén, Gruber & Puskás (eds. ), 2013); Fast, 2007). Using digital tablets as a resource in young children’s education might, thus, be seen as a way of bringing post-modern children’s technological resources into the classrooms, instead of stubbornly staying in “creaking, print-based educational systems” that do not show results (Luke & Luke, 2001: 105). Digital resources such as digital tablets, as illustrated in this study, could be used to enable children’s communication in more than one language, making the implications of this research project well-fitting in a diverse, globally expanding world. The main aim of this study was to explore how the use of digital tablets in preschools may enable children’s communication in a minority language, with a particular focus on children’s participation in multilingual activities. The results show how a multimodal, social semiotic approach, with the minority-language-speaking child seen as an active producer of language and knowledge, can help bring forth an alternative view of the possibilities of using digital resources in preschool environments. The importance of the emerging affordances of the digital tablet has also been shown as crucial for the possibility of these children to act and create these multilingual activities. 1The parents are free to apply to the Finnish-speaking group, but many choose not to. 2Financed by the County Administrative Board. 3Making and tinkering refers to the growing movement of, for instance, so-called Maker-Spaces, where various digital resources are used in creative projects, such as programming and robotics. 4The study is part of the ULL Graduate School, funded by the Swedish Research Council. 9Permission to use provided by Sound Touch Interactive. Aarsand, P., Melander, H., & Evaldsson, A.-C. (2013). Om media literacy-praktiker i barns vardagsliv. In: Bagga-Gupta, S., Evaldsson, A., Liberg, C., & Säljö, R. (eds. ), Literacy-praktiker i och utanför skolan. Malmö: Gleerup. Åkerfeldt, A. (2014). Didaktisk design med digitala resurser: En studie av kunskapsrepresentationer i en digitaliserad skola. (Doctoral dissertation). Stockholm: Stockholm University. Bagga-Gupta, S., & Carlsson, R. (2006). Verktyg & lådor: En studie om språkfokuserade aktiviteter för minoriteter på förskolearenor. Nordic Studies in Education, 26(03), 193–209. Benyamine, I. (2008). Digitalt berättande och identitet. In: Rostwall, A., & Selander, S. (Eds. ), Design för lärande, 195–202. Stockholm: Norstedts Akademiska Förlag. Bezemer, J., & Kress, G. (2014). Touch: A resource for making meaning. Australian Journal of Language and Literacy, 37(2), 77–85. Björk-Willén, P., Gruber, S., & Puskás, T. (eds.) (2013). Nationell förskola med mångkulturellt uppdrag. Stockholm: Liber. Bush, M., & Cameron, A. (2011). Digital course materials: A case study of the Apple iPad in the academic environment. (Doctoral thesis, Pepperdine University, Graduate School of Education and Psychology). DiGiacomo, D. K., & Gutiérrez, K. D. (2015). Relational equity as a design tool within making and tinkering activities. Mind, Culture, and activity, 23(2), 1–15. Fast, C. (2007). Sju barn lär sig läsa och skriva: Familjeliv och populärkultur i möte med förskola och skola. (Doctoral dissertation). Uppsala: Acta Universitatis Upsaliensis. Garcia, E., & Friedman, A. (2011). “There’s an app for that:” A study using Apple iPads in a United States history classroom. In: McCoy, L. P. (Eds. ), Studies in Teaching 2011 Research Digest, 31–37, Wake Forest University, Department of Education. Gibson, J. J. (1979). The ecological approach to visual perception. Boston, Mass. : Houghton Mifflin. Heath, C., & Hindmarsh, J. (2002). Analyzing interaction: Video, ethnography and situated conduct. In: May, T. (Eds. ), Qualitative research in practice, 99–121, London: Sage Publications Ltd.
Kjällander, S., Moinian, F., & Dorls, P. (2016). Mother tongue language teaching with digital tables in early childhood education: A question of social inclusion and equity. He Kupu, 4(3), 19–29. Konstitutionsutskottet. (2012). Kunskapsöversikt om nationella minoriteter. Stockholm: Sveriges riksdag. Levy M. (1997). CALL: Context and conceptualisation, Oxford: Oxford University Press. Nilsen, M. (2014). Barns aktiviteter med datorplattor i förskolan. (Licentiate thesis). Gothenburg: University of Gothenburg. Parkvall, M. (2009). Sveriges språk – vem talar vad och var? RAPPLING – Rapporter från Institutionen för lingvistik vid Stockholms universitet, 1. Stockholm: Stockholm University. Petersen, P. (2015). “That’s how much I can do!”: Children’s agency in digital tablet-activities in a Swedish preschool environment. Nordic Journal of Digital Literacy, 03, 145–169. Petersson, E., Lantz Andersson, A., & Säljö, R. (2013). Exploring nature through virtual experimentation: Picking up concepts and modes of reasoning in regular classroom practices. Nordic Journal of Digital Literacy, 03, 139–156. Sandvik, M., Smørdal, O., & Østerud, S. (2012). Exploring iPads in practitioners’ repertoires for language learning and literacy practices in kindergarten. Nordic Journal of Digital Literacy, 03, 204–221. Sauro, S. (2016). Does CALL have an English problem? Language Learning and Technology, 20(3), 1–8. Selander, S., & Kress, G. (2010). Design för lärande: Ett multimodalt perspektiv. Stockholm: Norstedt. SFS. (2009: 724). Lag om nationella minoriteter och minoritetsspråk; issued June 11, 2009. SFS. (2009: 600). Språklagen; issued May 28, 2009. Skolverket. (2016). Curriculum for the Preschool Lpfö 98. Revised 2016. Vetenskapsrådet. (2004). Forskningsetiska principer inom humanistisk-samhällsvetenskaplig forskning. Stockholm: Vetenskapsrådet. Vetenskapsrådet. (2005). Vad är god forskningssed? Synpunkter, riktlinjer och exempel. Gustafsson, B., Hermerén, B., & Pettersson, B. (eds.). Walldén Hillström, K. (2014). I samspel med surfplattor: Om barns digitala kompetenser och tillträde till digitala aktiviteter i förskola (Licentiate thesis, Pedagogisk forskning i Uppsala 167). Elanders: Sverige.